Patchy Work of Mini Grey: Getting ready to quilt! On Saturday however, I realized that the girl this quilt is for, her birthday is rapidly approaching next month. So I took it out from were it had been hanging in our wardrobe and went over to her house - she was at work - to check with her Mum if it would fit on her bed okay. Good thing I did as I then realized it needed just one more row. So thankfully I added that in quickly over the rest of the weekend. Here it is on our lounge room floor stretched out ready to be pinned. It measures 63 by 87 inches. 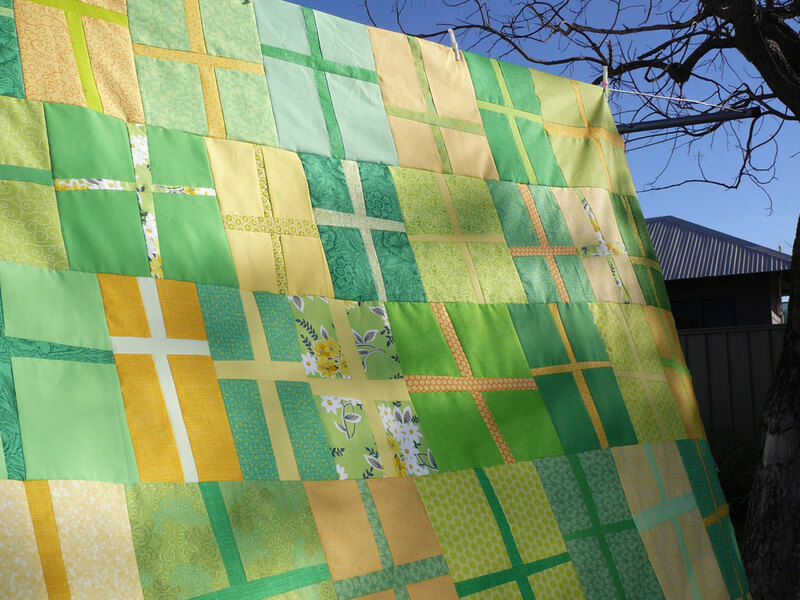 I was thinking of quilting it like this quilt here which I had admired since I saw it. 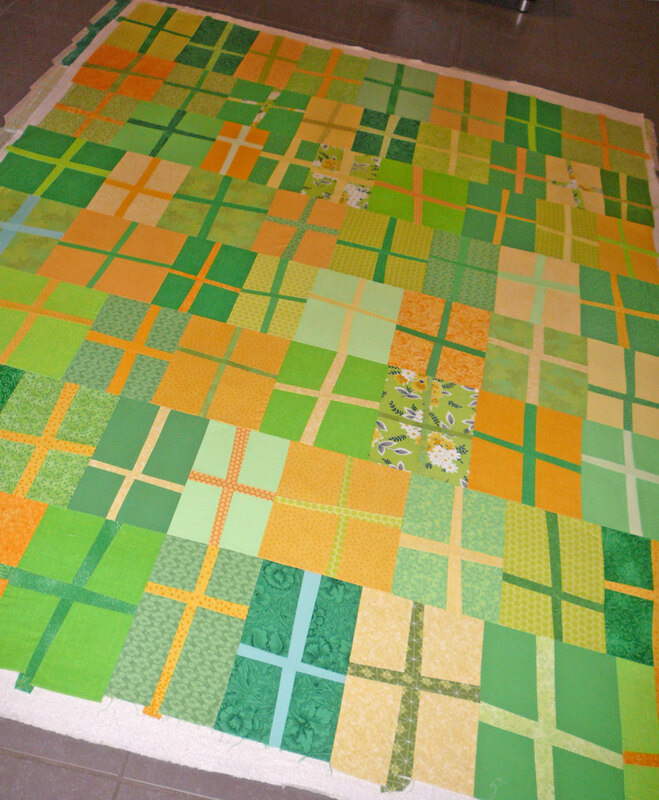 But all that twisting and turning which such a large quilt...... Maybe I'll just go with straight wonky lines, right to left. Easier and less stressful. 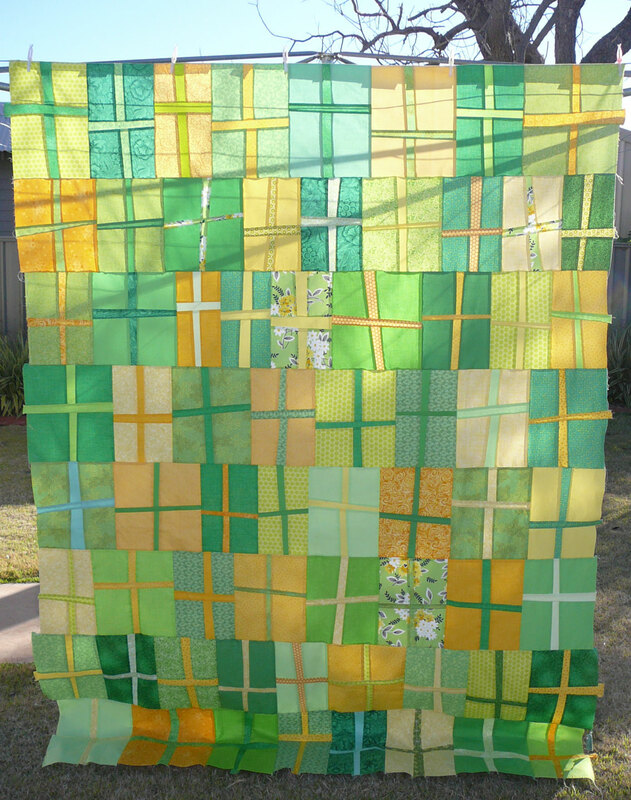 Save the spiral quilting for next time. You could always free-motion the spiral, then you wouldn't have to keep turning it! That's a gorgeous quilt top. And I think however you quilt it it will look stuning! Beautiful quilt no matter how you quilt it. Hope your sweet girl is feeling better soon. No fun having a sick little one! Hope she's right soon. You know, there isn't a lot of twisting involved. Your quilt isn't that much bigger than mine was (but then again I have a 10.5" throat on my machine...not sure how much space you've got). Because it's a gentle arc after the first few smaller circles you can go slowly with the walking foot on and it's pretty easy. I love lines, to though and did that on my Blackbird Fly quilt (it seemed to take ages, though!). I have another option for you. What about one large wonky cross about 3" in width, offset a little from the horizontal/vertical centers and echo quilted in each quadrant with "L" shapes that get progressively smaller as you approach the corners? So why DOES your head get smaller when I close one eye??? I just found your blog and have to say I love it! I am a beginning quilter-I have started a jelly roll quilt and found a picture of yours from 2011. It has given me the inspiration to continue with this project. Going to be a fan so I can come visit again.